Are you wondering how to get your kids excited to be outside this summer? Black Rock Retreat is excited to offer 8 weeks of high-energy, intentionally-programmed summer day camp in Lancaster County for campers entering 1st through 6th grade in 2019. Give your kids a summer experience they will not soon forget. Every week at Blast Day Camp, campers will experience the natural world around them, grow in knowledge and skills, and connect with new friends. It’s fun, with no Wi-fi required! Sign them up for one week, two weeks, or more! 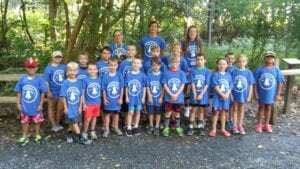 Why Blast Summer Day Camp in Lancaster, PA? Pick one week, two weeks, or more! A new way to experience the summer fun that Black Rock Retreat has been offering for over 60 years! Blast Day Camp will offer two age groups. Blast Day Camp Pioneers for campers entering 1st-3rd grade and Blast Day Camp Explorers for campers entering 4th-6th grade. Groups will have separate age-appropriate activities throughout the day and will be together for meals, swimming, and other large group games. Blast Day Camp begins June 17, 2019! Click here to see the full schedule. Sign up for as many weeks as you want! Each week runs Monday through Friday from 9:00 am until 4:30 pm with extended care available from 7:00 am until 6:00 pm (additional cost). Your camper will have a BLAST! Each week will have a unique theme that be throughout activities, crafts, games and devotionals. Click here to see the 2019 schedule. Questions? Check our the Blast Day Camp FAQ page or download the 2019 Parent Packet. Looking for an overnight camp experience in Lancaster County? Check out our overnight Christian summer camps.